"Data Visualization: Creating Impactful Reports through Charts"
Data visualization is an effective way to create impactful reports, dashboards that improve decision making, enhanced ad-hoc data analysis, better information sharing, increased ROI, time saving and reduced burden on IT. Data visualization is an essential component in the era of big data, enabling users to see trends and patterns that provide actionable intelligence. 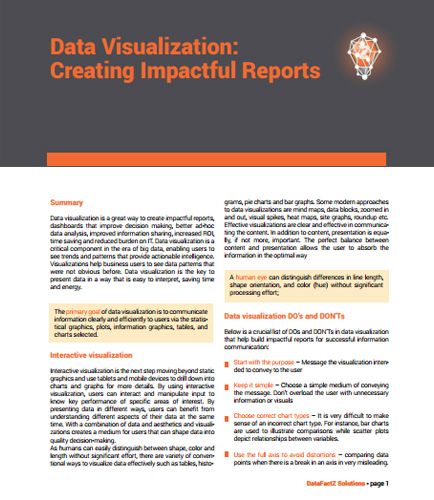 This white paper talks about data visualization techniques that enable the user to make faster decisions and a better technological investment.